The Braves' comeback prevented a shaky R.A. Dickey from getting his 11th win in a row. Mets manager Terry Collins was ejected in the fifth inning. The Braves' comeback prevented a shaky R.A. Dickey from getting his 11th win in a row. Bobby Parnell (2-2) gave up RBI singles with two outs in the eighth to Michael Bourn, Martin Prado and Heyward. 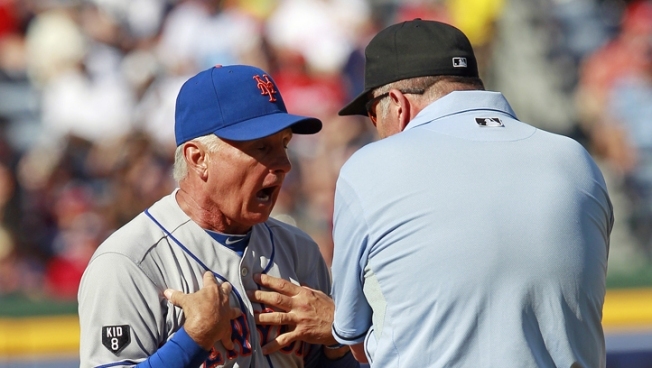 Mets manager Terry Collins was ejected while disputing a call in Atlanta's two-run fifth. With the score 3-all and Prado on first base with one out, Heyward hit a sinking liner that left fielder Jordany Valdespin charged. Third base umpire Dale Scott, the crew chief, initially ruled Valdespin made a diving catch and Prado, who had reached second, was trapped while retreating for an apparent inning-ending double play. But after the umpires conferred, they ruled — correctly, as replays showed — that Heyward's ball bounced. The umpires then placed Prado safely on second. Freddie Freeman's two-out, two-run double gave the Braves a 5-3 lead. Dickey was furious after returning to the Mets' dugout, slamming his glove several times against the bench. His teammates bailed him out by scoring three runs in the sixth to give the Mets a 6-5 lead and put Dickey in line to earn the victory. Dickey struggled for his second straight start. The All-Star knuckleballer allowed eight hits and two walks in five innings. Anthony Varvaro (1-0) allowed one hit and struck out two in the eighth. In the ninth, Braves closer Craig Kimbrel struck out Ike Davis, Daniel Murphy and pinch hitter Lucas Duda to convert his 19th straight save opportunity. Kimbrel has earned his 27 of 28 chances this season. Parnell gave up three hits while getting only one out. He was the third Mets pitcher of the inning, with Tim Byrdak and Pedro Beato also each being charged with a run. Ike Davis hit his 13th homer and Andres Torres' RBI single tied it at 3 in the fourth. The Mets got RBI singles from pinch hitter Justin Turner, Ruben Tejada and Valdespin to take a 6-5 lead in the sixth. Tejada added an RBI single in the eighth to make it 7-5. Braves starter Tommy Hanson gave up six runs on five hits and two walks in 5 1-3 innings. NOTES: Mets star David Wright went 0 for 5 with four strikeouts. He had reached base safely in 27 straight games, which was the longest active streak in the majors. ... Dickey is 0-1 with a 12.54 ERA in two starts at Turner Field this season. ... Hanson has allowed 17 homers this year. ... Chipper Jones went 0 for 5, ending his 14-game hitting streak. ... The Braves traded for Reds SS Paul Janish during the game, sending minor league RHP Todd Redmond to Cincinnati. ... Atlanta recalled SS Tyler Pastornicky, who struck out on an eighth-inning bunt attempt, from Triple-A Gwinnett and sent catcher J.C. Boscan back to the minors. ... Prado started at shortstop for the first time since May 4, 2008.